Love Island’s Dani Dyer announces shocking split from Jack Fincham | SHEmazing! We never thought we would be writing these words, but our fave couple from this year's Love Island are officially over. Dani took to social media to announced that Jack and herself have decided to go their separate ways. There doesn't seem to be any bad feelings about the split – but we are devastated, we thought a proposal would be on the cards, not a break-up. 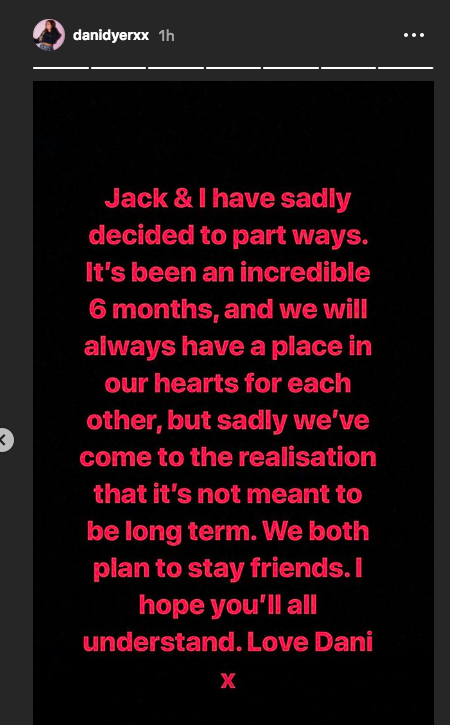 On her Instagram stories, Dani wrote: "Jack and I have sadly decided to part ways. It's been an incredible six months, and we will always have a place in our hearts for each other, but sadly we've come to the realisation that it's not meant to be long term." "We both plan to stay friends. I hope you'll all understand. Love Dani x," she said. Well, it's one of the more classier Love Island break-up announcements, and we are glad to hear there's no bad blood between them. Jack has yet to make a statement on the news. But only four days ago, the couple uploaded a selfie together as they prepared for the festive season, so the news will come as a shock to fans. 2018 has claimed another couple and we just can't cope.